A stunning 1930’s floor length evening,formal, party or wedding dress. This gorgeous dress is bound to turn heads. 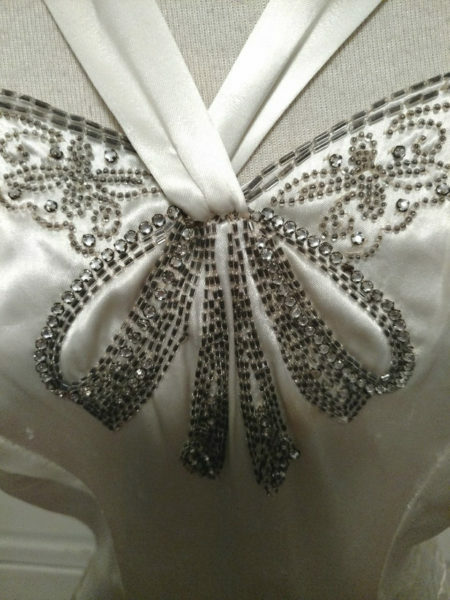 Made of Charmeuse liquid satin fabric, in a shade of ivory, that is lustrous to look at, as well as to feel. The skirt is made of six panels, letting this wondrous fabric gently flow to the floor. There the fabric softly lays in puddles The bodice is a simple but elegant style with a double set of shoulder straps. The wider straps lace through the center front forming a decorative V, which boldly connects to a dramatic “bow” made of set rhinestones, outlines in elongated black beads. Spectacular!